The following companies offer catnip products that have received average customer ratings of 4.5 stars out of 5 or higher on various online shopping sites and pet owners’ forums. The Ten Lives Club is a charitable organization that sells Catnip Kicksticks for $5. Profits go to housing and caring for homeless and ill cats. Owners say that their cats love these catnip-stuffed tubes, which are available in a variety of fun patterns. Kicksticks have a simple, clean design, with no small pieces that can be chewed off and swallowed. SmartyKat’s popular refillable Catnip Mouse includes a tube of certified organic catnip so that it can be refreshed as needed. 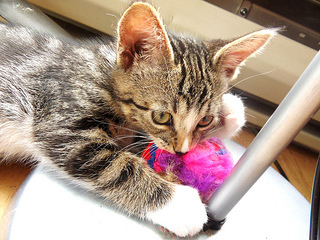 The Catnip Mouse is washable, and its cat-proof closure keeps it from spilling. SmartyKat sells other environmentally friendly cat products, including catnip spray, refillable catnip cat scratchers, and cat furniture. Yeowww! makes a variety of highly rated, award-winning cat toys, including the Purrr!-Muda Triangle (colourful catnip-stuffed triangles), cigars, fish, lemons, apples, bananas, and hearts. All catnip is certified organic. West Paw Design is an eco-friendly pet supply company, offering a broad array of handcrafted organic catnip toys in packaging that is both recycled and recyclable. Toy designs include mice, fish, flowers, caterpillars, and more. Krazy Kitty sells a range of catnip products, including catnip pillows and a refillable catnip blanket. Items are stuffed with certified organic catnip, no filler, and most of the simple designs lack pieces that can be chewed off. Castor and Pollux sells organic catnip, catnip-stuffed toys, organic cat treats and foods, and more. Refillable catnip toy designs include adorable mice, fish, and lobsters. Cat Claws offers certified organic loose catnip, corrugated cardboard catnip-infused cat scratchers, and seeds and full kits for growing oat grass for cats. The company also sells a variety of unique catnip toys, many of which are refillable. Cosmic Pet Products, a well-known brand that offers grooming aids, cat scratchers, and various toys, has introduced a line of organic catnip called Organic Wild Mountain. This catnip is barn cured and air dried. Meowee Wowee claims to have the world’s strongest organic catnip (how the company determined that this is the strongest catnip in existence is not specified). As Meowee Wowee is a relatively new product, there aren’t too many reviews yet, but the few that can be found are very positive. Some special promotional catnip packages include a cat sitter DVD. The Kong Hubba Wubba, an unusual cat toy that looks like an octopus with 4 legs, has proven to be a real hit with cats. The toy is made from catnip-infused fleece, its legs make a crackling sound that appeals to cats, and its overall shape makes it easy for cats to hold and wrestle. Kong offers a variety of other highly-rated cat products, including cute plush animals such as the popular Catnip Squirrel, cat dancers, environmentally friendly cat scratchers, and grooming aids. Kitty Hoots makes a line of extremely cute organic catnip cat toys, including its AppeTeasers catnip-stuffed critters, which have received high ratings on numerous pet product review websites. Other toys produced by the company have amusing names such as Zoom Stuffers, Catnip Fortunes, Springy Worms, Flippy Little Cat Squares, Doofus Dogs, and Cracklers (catnip-stuffed toys that make a crinkly paper bag sound). There is even a series of catnip-stuffed cloth politicians, including Arnold Schwarzenegger, Hilary Clinton, and George W. Bush. Seeds of Change sells a variety of organic seeds, including catnip seeds. Catnip is easy to grow indoors or out, and many cats prefer fresh leaves to dried. Planted in an outdoor garden, it acts as a natural pest repellent, driving away aphids, corn earworms, cucumber beetles, flea beetles, Japanese beetles, squash bugs, and mice. The Only Natural Pet Store has a wide selection of pet products, including organic catnip, various catnip-stuffed toys made from hemp, healthy cat foods and treats, cat furniture, and more. Only Natural carries many of the brands listed above, including Kong, Kitty Hoots, and Yeowww! The company also offers kitty garden kits, including a cat grass kit and an organic catnip kit.